Metroflor’s Aspecta Ten is a locking floor with isocore technology, making it ideal for spaces with imperfect subfloors that also want a quick installation with minimal downtime. There is no question luxury vinyl tile (LVT) has revolutionized the flooring industry. While the commercial vinyl market had once pledged its allegiance to VCT and sheet, the hottest resilient offering available today has gob- bled up market share from seemingly every other flooring category, including its closely related predecessors. With that, top LVT manufacturers take every opportunity to share their latest innovations to help differentiate from the pack. 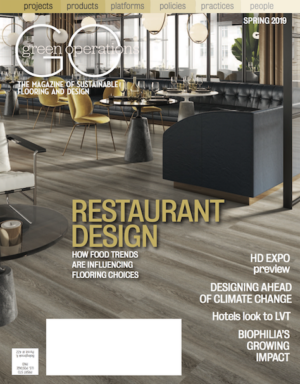 When it comes to design options, flooring companies that produce LVT have continued to go above and beyond since the product made its biggest splash yet around 2012. For example, EarthWerks’ Cocktail collection is a line geared toward the commercial market with a 22 mil wear layer and 30-year warranty. But what sets Cocktail apart is its color palette, which includes bold blues and greens in addition to grays, browns and beiges. The varied options allow for unique custom installations. “You can get abstract with fun colors,” said Lindsey Nisbet, head of product development and marketing strategy. For the contract space EarthWerks also touts its relationship with Enzo to create customized designs for any of its products using water-jet cutting technology. EarthWerks can add logos, patterns, pictures, designs and way-finding elements to provide one-of-a-kind installations. “The program [to create a design] is easy to use and removes the guess work from the process,” Nisbet said. “It is very cost effective and easy for designers to work with.” With proper labels and a floor plan summary, she added, a custom water jet installation can be installed in less than a day. Armstrong’s new Diamond10 technology uses the hardness of diamonds to keep its Natural Creations floors looking new through heavy traffic. By repelling dirt and stain-causing agents, the diamond-infused coating means Natural Creations floors are easier to clean, there- fore requiring less maintenance. According to the company, the new col- lection with 135 designs was created “in direct response to commercial interior performance needs, and emerging and future interior design trends,” answering the call of architects, designers and facility managers in various sectors for a number of reasons. For instance, Diamond10 technology also provides protection from alcohol-based hand sanitizers, making it a preferred choice in healthcare facilities. 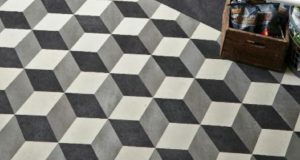 Uncommon tile shapes from Kardean create unusual yet attractive geometric designs like a Cubix installation. For Karndean Designflooring, its Kaleidoscope collection is a “home run” in the commercial market thanks to its different design features. Six atypical tile shapes are included in the line, including diamond, hexagon and rhombus, among others. “It’s a custom program that allows end users to design floors that fit their particular needs within a space,” said Emil Mellow, vice president, marketing. “It is very simple to select. Just pick the shape, pick a color out of almost 200 SKUs we have available and put in the design you want. It really creates focal points.” With a commercial grade rating standard to Karndean’s LVT, Kaleidoscope stands up to heavy traffic like that typical in restaurants or corporate environments. In working with the A&D community, Mellow said Karndean’s linchpin in communication is its Product Selector, a three-inch-thick coffee table book with a complete product catalog featuring large-plan view swatches and angled laid-floor images for every offering, along with a synopsis. “It’s part of our go-to-market strategy to get this resource in the hands of every designer or architect in a firm. We want it to be the go-to book on their desks. It is electronically linked on our website, but we understand these are visual people and they like having something in their hands.” The Product Selector — which is consistently updated in its digital form through its app and on the Karndean website — is now in its third generation and is available in addition to Karndean’s architect folders and its Commercial Sector Portfolio, which comes with educational materials to provide information on not only product but the company itself. 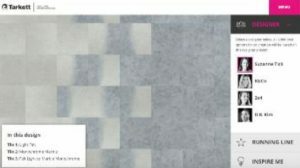 Tarkett’s Collections Infinies line allows specifiers to ‘co-create’ tailored product using selections from world-renowned designers through a unique online visualization tool.